Local Albany chefs show off their skills in this three-day food and wine festival to raise money for the arts! 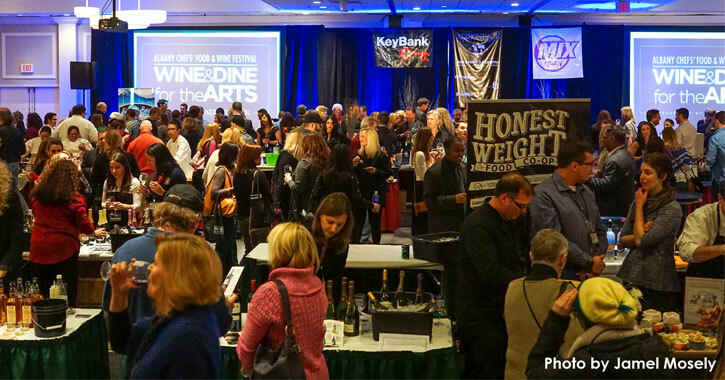 The Albany Chefs' Food and Wine Festival will take place at the Empire State Plaza on Thursday, January 17 through Saturday, January 19, 2019. This is a great opportunity to support downtown businesses, including local art exhibitions and restaurants. Throughout the weekend you will taste top-of-the-line food and wine pairings, and will learn about the impressive art of food and wine preparation with cooking demonstrations and wine tasting seminars. The 2019 Festival is a celebration of Indian culture. Inspired by the brilliant colors of the Holi Festival, the 2019 Festival image features bursts of colors playfully spattered throughout as a backdrop for the national symbols of India. The Festival bottle emerges from the lotus forming the archway framing the Taj Mahal complete with the birds swirling about. Our 10th Anniversary Grand Gala Reception & Dinner presented by MTx will feature the food, wine, arts & culture of India! Please Note: For tickets purchased online, your email confirmation is your proof of purchase. Please print & present at registration. Must present government issued photo ID to enter the event regardless of ticket purchase. No one under 21 will be admitted to the event.